Winter Olympics gold medallist Lizzy Yarnold made a big impression with her appearance at Fareham parkrun on Saturday. The 2014 skeleton champion was one of the volunteers on Saturday and certainly had a busy morning. She provided great support to everyone involved in the 73rd Fareham event. To thank sports fans for all their support, many of the UK’s top National Lottery funded athletes are taking part in #teamparkrun, volunteering as tail walkers at parkruns across the country. Fareham had 184 finishers on Saturday. Glen Turner, who was visiting the event for the first time and is a member of Leighton Buzzard, crossed the line in first place. City of Portsmouth’s talented teenager Callum Crook was second and third was Matthew Brown. 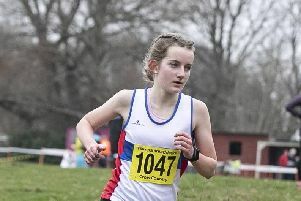 The first female finisher was another City club member, Eleanor Purdue, who is in the 15-to-17 age group. Geraldine Perrier, who is a member of Fareham Crusaders, ran with her club-mates Pete Abrahams and Paul Pickford and she finished second lady with a time of 23min 37sec. It was also a good morning run for Fareham’s Neil Driscoll, Fleur Jones and Stefan Goodson who all got new personal best times for the 5k event at Cams Hall Estate. Malcolm Richmond completed his 100th parkrun on Saturday and David Hughes achieved his 50th. Stubbington’s Kelley Haniver ran a good time of 19.37 on Saturday to finish first lady and she was in fifth place overall. Daniel Foster, who also runs for Stubbington, took first position with a new personal best time of 18.24. Whiteley first timer Ian Hayward finished in second place with 19.08 and third was Ben Kiletjie in 19.16. Among the runners to get new personal bests on Saturday were Stubbington’s Anna Wilby-Lopez, City of Portsmouth’s Godfrey Rhimes and Steve Wise, of Gosport Road Runners. In total 183 people took part in the 19th event along with the volunteers who made sure everyone had fun. The event takes place at Whiteley Meadowside, PO15 7PD and takes place at 9am every Saturday. The 113th Lee parkrun saw 401 people complete the 5k along the promenade. Tom Barnard finished first with Matthew Brown second. Sarah Ruby Rennison was first lady (21.10) just ahead of Kel Richardson (21.11).